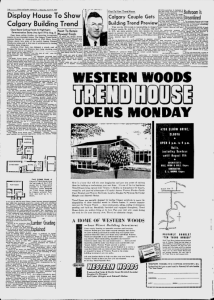 What are the 1954 trends in on building in Calgary? 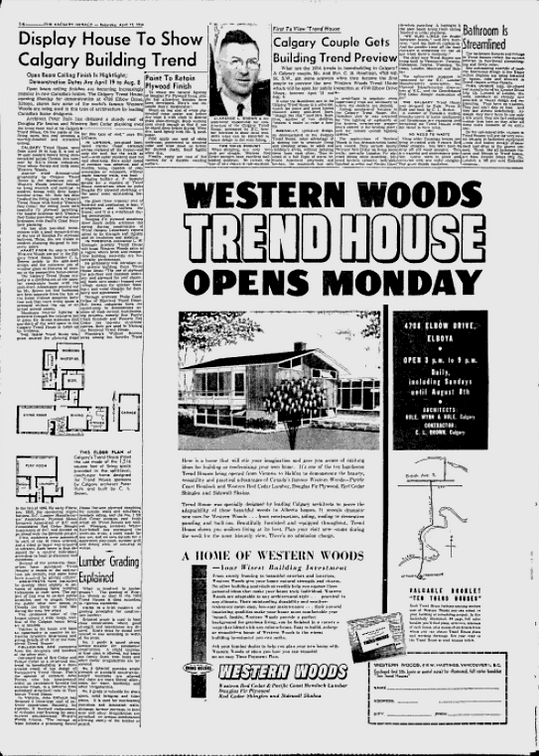 A Calgary couple, Mr. and Mrs. E. Hamilton got some answers when they became the first people to preview the new western woods Trend House which will be open for public inspection at 4738 Elbow Dr. Elboya between April 19 and August 8. If what the Hamilton saw in the Calgary Trend House is a criterion, watch for more and more homes planned a long split level lines. “Designed like this “said Mrs. Hamilton, mother of two children, “makes it easier to raise a family”. Basically, split level design, as demonstrated in the Calgary Trend House, takes advantage of a sloping site to separate living and sleeping areas, or adult and children’s areas, without isolating them from each other. Thus instead of a full flight of stairs between basement playroom in the kitchen, the housewife has only a semi flight with supervisory trips are necessary to where the children are playing. Among the mechanical features in the Calgary Trend House, Mr. Hamilton said that he was attracted by “the lighting of cupboards in the kitchen, Weather Eye temperature control in the heating plant, and the remote control lighting system quote. The applications of western woods in this demonstration home are varied. They include knotty Western Red Cedar on the living room walls, specialty Douglas Fir plywood dining room paneling, plywood kitchen cabinets, Bedrooms finished in Cedar and Pacific Coast Hemlock penalty. It highlight is the open beam living room ceiling finished in Cedar plank. The other nine Trend Houses are being built in Vancouver, Victoria, Edmonton, Regina, Winnipeg, Toronto, London, Montreal and Halifax. The nationwide program is sponsored by the BC Lumber Manufacturers Association, the Plywood Manufacturers Association of BC, and the Consolidated Red Cedar Shingle Association of BC. The Calgary trend house was designed by Rule, Wynn & Rule, and built by C. I. Brown. A number of Canada’s leading manufacturers of home appliances and furnishings are equipping and furnishing the Trend Houses with the latest in their lines.